La Costa condos have recently been a problem for Carlsbad Realtors and their buyers–especially when it comes to financing. Lender approvals can sometimes be tough if no VA or FHA financing is available. During the Great Recession, many home owner associations let their FHA and VA approvals expire–perhaps because some of the offers on these condominiums were for cash–or for whatever reason. La Costa Sea Point Tennis Club, for example, let their FHA Approval expire in 2012 and we are set for the struggle to regain approvals. If only these HOA’s, their unwitting officers and management companies had known the problems they would be causing for their homeowners as well as property values, because markets DO recover. This has been a nagging problem for our company, which specializes in Carlsbad and La Costa real estate. We recently had a wonderful client who wished to refinance his gorgeous and luxurious La Costa condo at Mountain View Town Homes with his well-earned VA eligibility. Unfortunately, the HOA had let their VA approval expire. Were it not for the tireless efforts of Jenny Nguyen with WJ Bradley Financial Services, this would never have been possible. This mortgage professional never let up and last week we all received word that VA approval had been granted for all the luxury town homes at the small Mountain View development located just off the La Costa Golf Course on Romeria Street. If you are interested in getting pre-approved for a home or condo purchase anywhere in San Diego, give Jenny a call at either 858-799-0747 or 858-877-8008. Motivated Sellers! Nestled along the Omni La Costa Resort and Golf course, function & convenience are in perfect harmony at this private Carlsbad retreat. Exquisite main level ready for entertaining: 2 decks, bedroom and full bath, huge windows & roomy lounging area. Upstairs boasts enormous master suite w/ walk-in shower and tub & separate closets incl. a walk-in closet, 3rd and 4th bdrm and an additional full bath on upper floor. Laundry on upper level. Bonus game room on lower level. Great value in the gated and prestigious Jockey Club! This 3663 sf elegant beauty complete with elevator offers a spacious & open living room with two crystal chandeliers, 20' plus ceilings, floor to ceiling windows, large marble fireplace & two sets of sliding doors that open to a private patio. Family rm downstairs can easily be a 2nd master bedroom, office, den or gym. Amenities include pool, spa, saunas, clubhouse, hospitality host and direct golf cart access to the Omni La Costa Country Club. No expense was spared on this beautifully remodeled Omni La Costa Golf Course frontage townhouse at the prestigious gated Jockey Club. With 3336 Sf of spacious living and 20’ plus ceilings and soaring windows, this French designed luxury home offers gourmet kitchen, European oak flooring, custom cabinetry, motorized and designer window coverings and wall treatments throughout. If you are looking for a showcase view home with an easy care lifestyle and a secure community, you will not be disappointed. 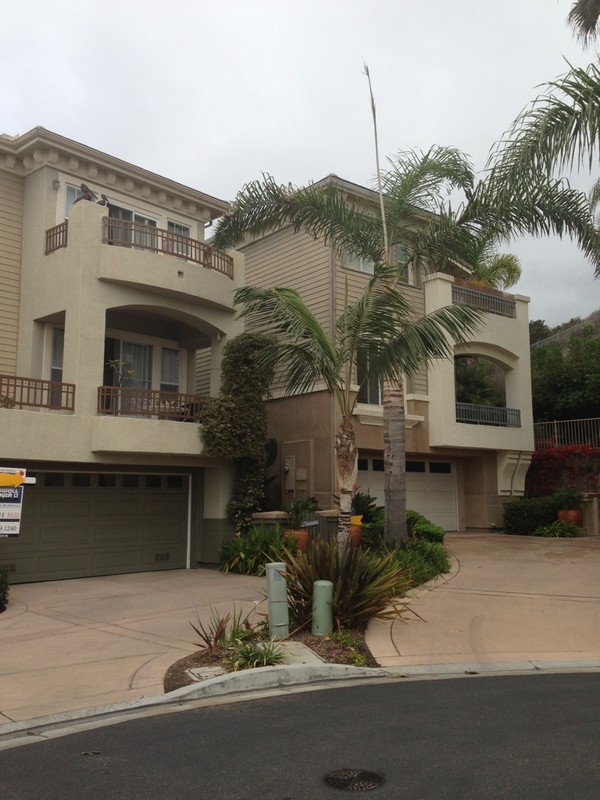 Rare Opportunity!This beautiful corner unit townhome located in the heart of La Costa. With beautiful hardwood floors, stainless steel appliances, and fresh custom paint. Enjoy nightly sunsets and lagoon breezes from any of the 2 private decks. The gated community has a private park, hiking trails, pool, spa, and tennis courts. Close to La Costa Resort, The Forum Shops, and has convenient 5 Fwy access. This light/bright end unit will move quickly. La Costa Canyon HS too! Perfect opportunity to own a home in Carlsbad. This 3 bedroom 2 full bath townhouse is located in the beautiful community of Rancho Carrillo. Master Bedroom Suite on entry level with its own private patio. New paint and a two-car garage with laundry. This lovely end unit includes a balcony off the dining area on the second level. Near the peak location in Carlsbad, conveniently close to the highly rated Carlsbad schools, parks, clubhouse, dining, shopping plazas, beaches and more. Beautiful and highly upgraded twinhome that lives like a single family residence. Vaulted ceilings, lots of natural light, spacious loft, entry level master! Upgrades throughout including plantation shutters, new flooring, baseboards, paint, fireplace stone, granite counter tops in kitchen, soft close drawers, turf landscaping, new fencing, central AC. Great location with easy access to schools, shopping, the beach, and freeways. Resort style community pool. Don't let this beautiful home pass you by! Single-story twinhome in La Costa. Exceptional opportunity....lives like a detached home. No HOA or fees of any kind. Floor plan has an open-living-area concept including a cozy fireplace, 3 bedroom, and 2 bath. The living area opens to a large private patio and gardens. 2-car garage plus long driveway for additional parking. Within blocks of the acclaimed La Costa Meadows Elementary School. No steps of any kind; very private location. Enjoy Carlsbad living for under $500,000 in this beautiful upgraded townhome. Purchase furnished or unfurnished. Huge 2 car attached garage with extra storage, 2 bedroom, 2.5 baths. Bright and open. A great small community of Carlsbad. New wood-look vinyl floors and new carpet installed, and rooms painted in a neutral color palette. Large master suite with double closets. Master bath has dual sinks and tons of storage. Common area in community features a fire pit, seating and ocean view! This bright and airy end unit is one of five townhomes conveniently located on La Costa Ave. Minutes to shopping, spa, golfing, and the beach the unit is 1568 sq. ft. featuring 2 well sized bedrooms each with their own full bathrooms. The main floor has a roomy kitchen, open concept living and dining, a half bath and laundry room. Beautiful move in ready town home in the desirable Villas De La Costa. This home features 3 bedrooms, 2.5 baths, spacious 2 car attached garage, laundry room, whole house fan, calming ambiance lighting and so much more. Location is key, so close to everything. Blue Ribbon school, parks and walking distance to La Costa Town Square. Must see to appreciated. A truly unique, rarely on the market home located in a La Costa upscale, privately gated community surrounded by multi-million dollar homes. Only one of its kind, end unit for most privacy, larger lot + private side. Unit offers an open contemporary design, main floor full of natural light, ocean breeze + amazing views! Loft office(Optional Bedroom) lower level custom master suite w/huge walk-in California Closet+ spa area, upper level balcony, patio of master suite +2 cars garage.Perfect coastal retreat. TURN KEY! Beautiful DUAL MASTER two bedroom, two and a half bath unit at Valencia in Rancho Carrillo. Freshly upgraded with custom paint, new carpet, wood floors, A/C, stainless steel appliances, and granite counter tops in kitchen and bathrooms. Plantation shutters,newer lights and security screen door latest upgrades. Attached 2 car garage with additional storage. Top rated schools. Enjoy Rancho Carrillo walking trails & historic Leo Carrillo Ranch. Access to 2 pools & barbecue at complex & community.